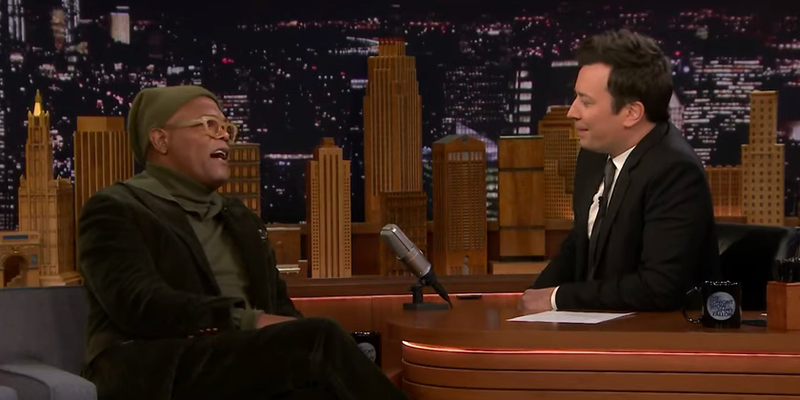 On Monday’s Tonight Show, Glass star Samuel L. Jackson revealed some pretty surprising secrets. For one, he’s a really good pal of Judge Judy Sheindlin, which suggests all manner of action comedy casting possibilities. For another, on December 21, the perpetually badass actor turned 70, which, to steal a quote from Liz Lemon, “Is he some kind of wizard?” And, yes, Judge Judy was at Jackson’s New York birthday bash, and yes, Tonight Show/The Roots bandleader Questlove did perform, and yes, Sam and Judy did kick it on the dance floor, because the world is a strage a beautiful place. Also, the proud Jackson reminded Fallon that he was in New York for the big day because his wife of 38 years (they’ve been together for 48), LaTanya Richardson Jackson, is playing Calpurnia alongside Jeff Daniels’ Atticus Finch in the Broadway smash production of To Kill A Mockingbird. Still, Jackson gave the biggest gift to Fallon and his audience by playing along and naming his top five favorite Samuel l. Jackson characters ever. (He already sort of did that for the A.V. Club, but, whatever.) Hemming and hawing a bit at first by claiming that it’s hard to whittle down his 120 or so movie characters (well, only a hundred or so are in contention, Jackson conceded), Jackson delighted the crowd by happily picking his favorites to play. No spoilers for the top five, as it’s undeniably cool to listen to Jackson really give some thought to his choices, but sadly, aficionados of the clearly eternal thespian’s interesting work in overlooked indies like The Caveman’s Valentine, The Red Violin, or Paul Thomas Anderson’s Hard Eight can exhale. (Nor does the actor particularly relish intrepid motherfucking reptile nemesis Neville Flynn, apparently.) Still, Jackson’s own favorite role might surprise some people, as he cited how much of a blast it was to work with [female co-star redacted], and how that character’s planned death scene was scuttled after test screenings showed how much audienced agreed with how indispensible he was. And sure, Jackson may have fudged the final count a little by combining all of the roles he played for a particular director into one pick, but nobody’s gonna call Samuel L. Jackson on that.